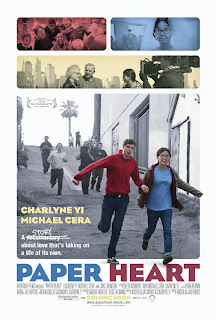 Paper Heart is the half-real, half-scripted story of Charlyne Yi’s quest to discover what love is and if it can exist for her. Skeptical about happily-ever-afters, she goes out to ask every day people, couples young and old, gay and straight – even scientists and Las Vegas chapel ministers! – to see what they have to say about the subject. Amusing, to say the least. And Cera was great playing the role he seems to have perfected: the awkwardly sweet, quirky guy who’s too funny for words. I don’t think I can imagine him in any other role, but thankfully I haven’t had enough of him yet. Paper Heart is genuinely sweet and provokes some thought on true love and the different forms it can take. Maybe I enjoyed it so much because Yi’s skeptical view struck a chord with me, but it’s also because I appreciated the lack of unnecessary sap and her refusal to apologize or force feelings she doesn’t possess – yet. Aw I will definitel check it out!! Thank you so much for the review! I've been wanting to see this and it's nice to hear some feedback! Toasties....love it. This makes me want to see it. The problem? I always forget the movies I want to see by the time I actually GO to see one. I'm catching up on my movies to watch list - I'm up to 1978 now with Animal House "on tap". Actually I just came by to say "Hi". Man I feel so out of the loop! I have no Internet at home because the free WiFi I was "borrowing" is no longer available! And then I can't use the cable connection because my PC is still out of commission and I can't seem to make it work on my iBook. Bogus. I think I'm going through withdrawal even though I'm online for 8 hours a day. I'll have to check this out. I really enjoy Cera. I haven't got tired of his awkward, sweet character either. I have never heard of this movie. I will add it to my Netflix queue.